Several years ago my husband (then boyfriend–how casual, right?) illegally sold our mattress on craigslist (shhhh), packed up everything we owned into a U-haul and left our home in Los Angeles to make a new one in the SF Bay Area. We had a cushy beginning to our new chapter, and were blessed with a ridiculously nice house to stay in. My parents had converted the house I grew up in, into my Dad’s music studio. There was still plenty of house to be lived in above the music studio. Too much house for us, actually. We were just a couple of kids with a really cheap coffee table that moved into a very nice house on a very nice hill in a very nice neighborhood. My dad would work downstairs, and bass would pulse through the floorboards. Artists would come to work and occasionally stay. It was our job to make them feel at home since we were living there. I have stories, guys. So many stories. But, this post isn’t for those–this post is to lament about the year that I really started cooking. 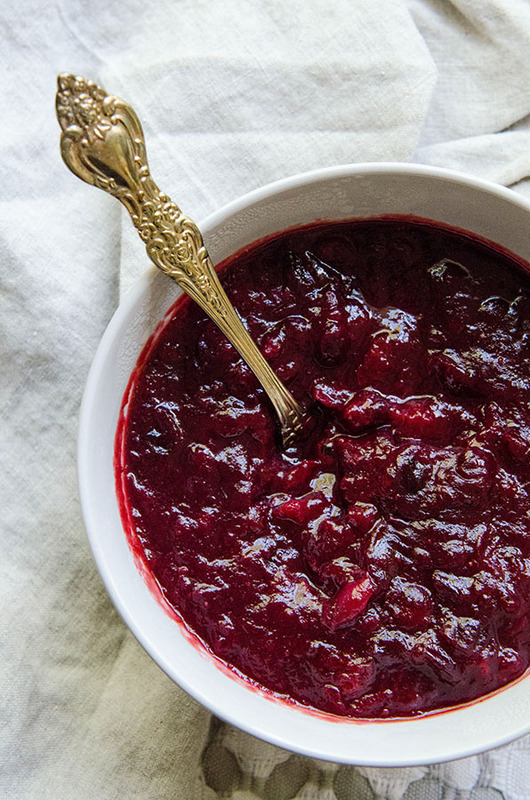 This was the year that I discovered that I could make my own cranberry sauce. Our kitchen in Los Angeles was not just small–it was punishingly small. My husband and I could not fit in there together without our butts touching, or fronts touching…there was a lot of touching when there shouldn’t be touching. It was a tiny corner galley kitchen. I had about a square foot of counter space to do my chopping and mixing. But, never the less, I made things. I baked so frequently that my neighbor at the time gifted me her very lonely Kitchen Aid Mixer (thank you, Monica–she’s still getting a work out!). I fell in love with food there—well, more in love with food, as I believe I’ve been in love with food since I took my first hungry breath on this earth. But, it was in that apartment with that crappy stove and the absence of counter space and the shiny black widow that would drop down from the oven vent when things got too hot, that I began to play and find my voice with food. I wasn’t simply replicating things my mom had taught me to make before college, I was now playing with flavors and watching a lot of Rachel Ray. When we moved into The Studio House, the first thing I did was walk into the kitchen. It was huge. Large tiled counters, and cabinets that didn’t stick shut with lead paint. A gas range stove and two ovens. It felt surreal on so many levels. This was the place, the same kitchen where I grew up–this is where my mom taught me how to make spaghetti. These counter tops used to be full of homemade Christmas candy come the holidays, or the place where we would make big salads in the summers. This space seemed sacred to me, and I was overwhelmed by both nostalgia and joy to be able to use it as my own. That year I taught myself how to make soup. I developed recipes for curry, something I never grew up with. We made cheesecakes and gluten-free carrot cake. I cooked pesto pasta, and tried and failed at making my own mayonnaise in a food processor. There were lots of salads and grilled pork chops. I taught myself the art of the twice baked potato. And, somewhere in there, come November, I taught myself valiantly how to make cranberry sauce from scratch. I was blown away, you guys. It was so simple. I had grown up with the jiggly cranberry sauce from a can, so the thought of making fresh cranberry sauce seemed gourmet and luxurious. Imagine my surprise when I learned it was as easy as throwing everything in a pot and waiting for the berries to burst under the heat. So. Easy. So easy that I made lots of it. Like, a whole bunch. 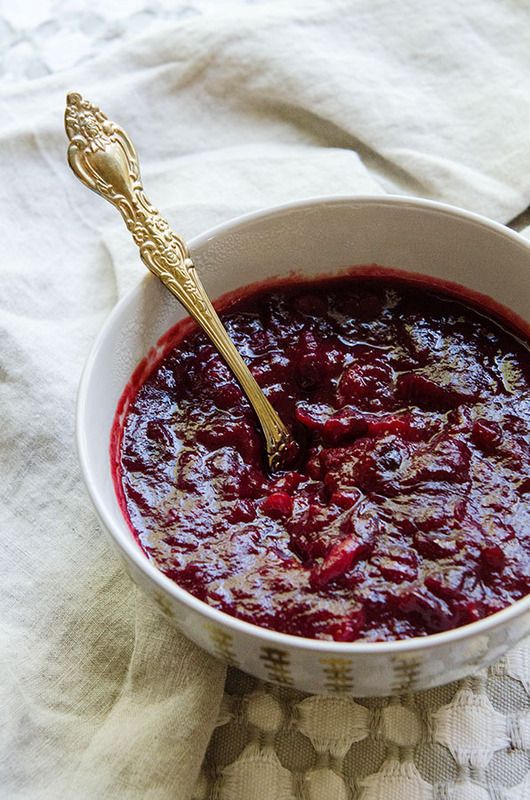 Like, a soup pot’s worth of liquid cranberry love. I couldn’t stop. It was as if I had forgotten that this was a side dish. No, I HAD forgotten it was a side dish. 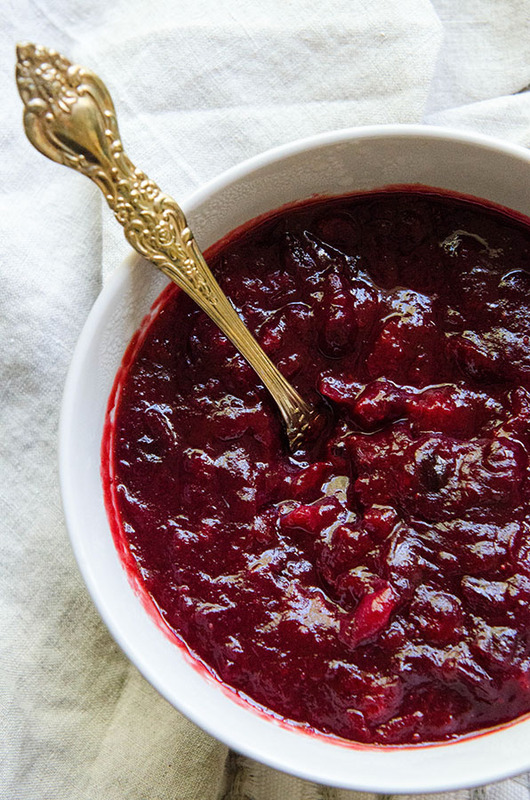 After forcing my husband into eating wayyyy too much cranberry sauce he gently and diplomatically reminded me that it was called cranberry sauce. As in, this was not meant to be a main dish. “Like…you wouldn’t serve someone a bowl of mustard, right?” Ok. Ok. I get it. I just got excited. Also, for the record I have not lived this down to this day. Every single year someone reminds me of the great cranberry saucing of 2010. I apologize for my aggressive approach, but I will never apologize for how freaking easy it is to make. So, it is with an open heart and some life experience that I can warn you that YES, it will be exciting to make your own cranberry sauce. You are indeed magic. Just, maybe–don’t be like me. Don’t serve it like a soup. Be gentle with it, and it will be good to you. Also, less relatives will make fun of you. Like, a lot less. Live wild, love hard, and sauce with reasonable caution. This recipe is a little bit zingy with the heat from the ginger beer and the brightness of the citrus! 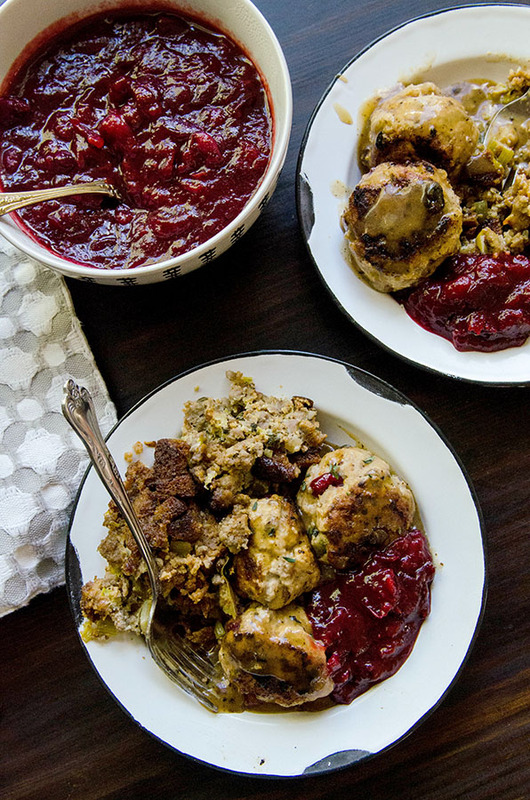 It’s a perfect match for my Thanksgiving Meatballs with Pan Gravy and my Grain-Free Apple, Sage + Sausage Stuffing! !